Every expedition is a surprise and, if you recall yourself as a child on Christmas morning, anticipation is something they love. In this article, I’ll highlight six remarkable benefits to children who metal detect–all to do with health. #1 Physical – Exercise is essential for all children. 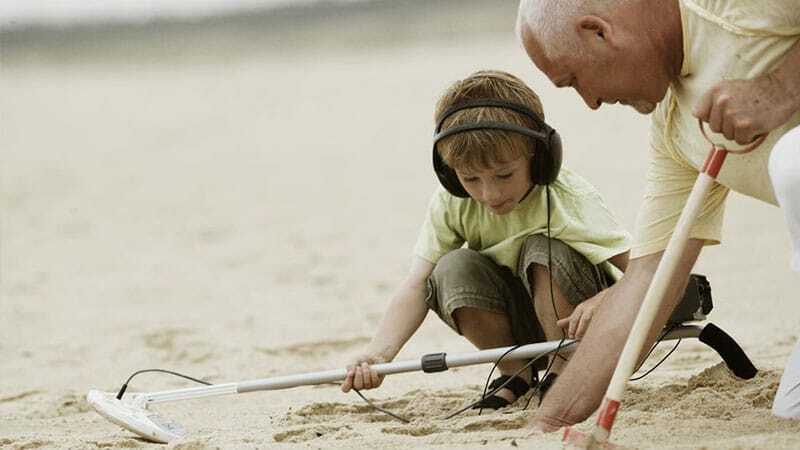 The first and foremost benefit… Metal detecting gets the child up and about out of the chair and their heads, and into their body, nature and the living breathing world. There’ll be lots of surprises and opportunities to dig into dirt. It’s also an excuse to spend time disconnected from technology, where you can talk about many things in your surroundings and how you are connected to it and the past. An excuse to banter–an excuse to bond–as you explore new territories together. This is something any child likes to do, boy or girl… At that age, the world is full of marvels and wonders–possibilities. Metal detecting simply increases the dimension of investigation and exploration of the world, down into that hidden beneath his or her feet. It’s however, a good idea to think about ways of combining activities. For example, maybe you could go to the beach, the park, a lake and combine metal detecting into the experience–with a swim, picnic or adventure walk. So, if your location isn’t rich with targets, you have other things to do (public places are also more likely to contain targets). Prompt curiosity and independent investigation, as well as creativity, through exposure to the environment. A geology lesson of sorts… Children learn to pay attention to different kinds of soil and rock and how they differ by location and the kinds of objects they discover. This is a hands-on form of self-education. For example, digging for targets teaches children about the link between now and the past in a direct way. Finding an old coin or penny or ring offers the child a type of context that is fast becoming uncommon in the age of cloud connectivity. There are many psychological reasons why it’s important children understand their place in history. One, is it raises questions in the child’s mind of life throughout time. What better way is there to build a genuine curiosity about the world that will blossom throughout the child’s life, than by a hands-on discovery of old worlds? There’s a game adults play with babies, called peekaboo. That baby has no concept of what a hand is. When her parent covers his face with this unknown object, for her, this is an existential shift in reality. The disappearance of her safety figure; then a sudden re-emergence… Before the baby cries in shock, the parent reveals his face and the baby cries out in laughter. What better way to prompt investigation into the ancient Romans or rural life in your city 200 years ago, once that baby grows older? As adults, we can forget the thrill that comes with discovering unknown worlds. For you, an old coin might be a gold you could sell. For the child, they are Indiana Jones discovering ancient scrolls, precious stones and long-lost trinkets from a not-yet-discovered time in history. Finding your target also requires some level of ingenuity. You probably couldn’t train a dog to metal detect; there are too many nuances. The child needs to use creative imagination. In order to improve at being able to detect specific objects, the child needs to imagine the object they are looking for and then to associate the correct strategy for finding that object. For example, the chances of finding a gold nugget in thick grass is very low, however the chances of finding a ring or ear-ring in a public place of relaxation is much higher. Items hidden in the belly of the ground, discovered by the child, raises her sense of ability to discover the unknown through perseverance, patience and tact. You might say that this is a naïve sort of reward. However, as books like Deep Work by Cal Newport suggest, such stoic characteristics are becoming increasingly rare at exactly the same time that they’re becoming increasingly in-demand (for e.g. in terms of employment). Training your child to spend long stretches of time scanning for treasures trains them to focus on one task and to see it through, even when there is no immediate payoff. The reverse of this is obviously social media and mobile phone apps. These apps have become so dangerous in terms of spiking dopamine that Silicon Valley programmers have switched to using flip phones, which have no ability to run sophisticated apps–even though these programmers are the people creating these apps! ‘I believe that we have as a society misconstrued and conflated these two positive emotions–pleasure and happiness… in fact they are not the same… Pleasure is dopamine and happiness is serotonin. Essentially, this is the difference between a bottle of Coca-Cola and a glass of water. One issues a spike in energy, pleasure and non-satiation. The other (water) lowers your chances of headaches and gives you the energy you need to focus steadily. Even a basic metal detector will have options on it that can be twiddled–in which the child can adjust if they want to improve their outcome. In more complex detectors, there are advanced options like the “ground balance” function to eliminate feedback from mineralization from salty earth, for e.g. sand. The child will also practice paying attention to small details like distance of the scanner from the ground, listening attentively for any signal of detection. Or using the “pinpoint function” to hone in on a potential target… Many of these skills also raise questions, particularly for precocious children. For instance: what does mineralization mean and why is it relevant? Why does a coil have the ability to detect something several inches away? These are the questions that spark life-long obsessions and great achievements that benefit wider society–though you may need to do scrubbing up on basic science principles (they always have the option of questioning their science teacher). You can help to teach your child how to discern between good targets and bad targets by creating a test garden. If your detector doesn’t have “discrimination” abilities, clear away junk targets in the test area, and insert coins into the ground at varying depths. Get your child to swing the coil over targets and to listen to the tone the detector makes and what the screen registers. This will give them the basis for future strategies, for estimating how deep targets are and will remove some guesswork. A fun game you can play is to throw a few coins into a small area, such as tall grass. Challenge your child–see if he can retrieve each coin. If he does, he will have a feeling of accomplishment. NB. It’s a good idea to look for lightweight, professional grade metal detectors with adjustable handles that can be shortened to fit the kid. Also, something high functioning, but easy to use, will let the child get started straight away. Professional detectors will give the child room to learn proper technique and attention to detail. This is why it’s not a good idea to buy from a toy store, because those machines will be unlikely to the produce reliable results, which will just lead to frustration and boredom. This kind of exploration was the norm for children of earlier generations – those periods captured by poets, of a time when rural life was the most common experience. Sounds clichéd but what you pay close attention to becomes realer. Basic practice in metal detecting is to dispose of junk, rather than throwing it back where you found it (one of the reasons many private lands, open to the public, allow metal detectorists). This is a good lesson to teach to the next generation–that small things add up and don’t disappear by magic. There’s no better way to learn this then picking up that which has been disposed of negligently. No great ethical speech required, as the act of disposing of junk properly will become automatic. Then watch as that child proceeds to take this awareness–of the small things–to other areas of her life, such as personal relationships. What unites heroic fictional/non-fictional characters, from Indiana Jones to Steve Jobs to Amelia Earhart, is tenacity, patience and dare enough to pursue something not yet realized. Another way of describing this trait is stepping into uncertainty rather than running away from it. Psychologically, you are teaching your child that there are many things that lie await in potentia, and which are waiting specifically for your child to have the forthrightness to investigate. This contrasts with passivity–following life rules with predictable outcomes from predictable actions. Instead, you are teaching your child that there are of course, good modes of behavior, but there will always be an element of uncertainty involved in pursuing anything complex. The thrill of not having a guarantee of success but taking the risk anyway is the essence of what it means to be a hero, what it means to be human, and especially what it means to have the spirit of youth. So assuming you have a machine up to the job, your child now has an ability to uncover the known from the unknown. Where Is The Best Place To Go Metal Detecting In Winter?